1.1 What Are Guitar Impulses and Impulse Responses? 1.3 Why Bother With Guitar Impulses? 1.4 How Do I Use Impulse Responses? 1.4.1 What do you need to use Impulse Responses? Is it Free? 1.4.3 What is in the pack? 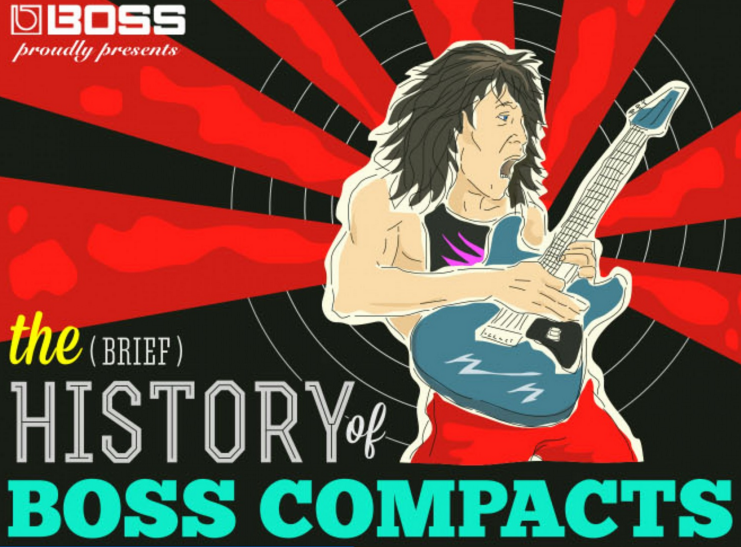 This is a basic guide to help you understand what guitar impulses are and how they are used. We have also included a step by step guide showing you how to load impulse responses in a DAW, as well as a free download pack of all the software you need. Impulse responses are very useful for a guitarist to know about as they can really help you once you start to explore the wonderful world of amp simulators, as well as recording and mixing. Although guitar impulses can be quite complex to discuss and explain, we have done our best to make it as beginner friendly as possible. Read through the post and discover a whole new range of possibilities for your sound. As a guitarist, you may have noticed that there are an incredible amount of options to choose from when it comes to your sound. 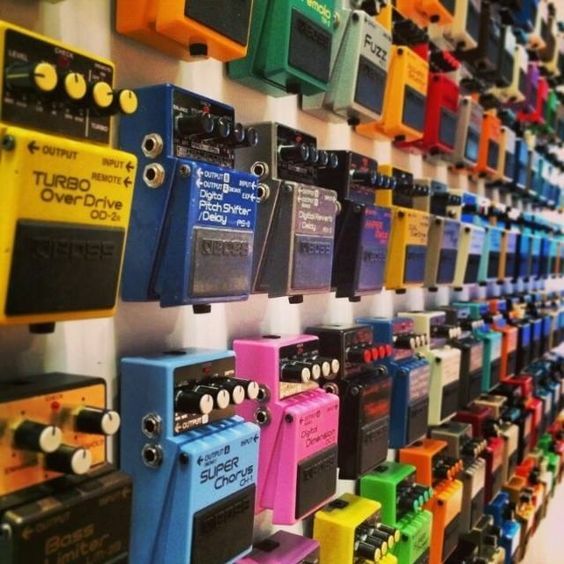 There are hundreds of guitar amps, cabs, heads, effects pedals and much more. A lot of these can be quite expensive, usually take up a lot of space, and some are simply hard to come by. Then there is that other minor problem with large amps, the amount noise that they make. One of the first solutions to this (which also adds to the list of options to choose from) is to go digital when trying to get your sound. This is a great option because most digital products are a lot cheaper and widely available. This is also a great choice for those who want to practice guitar in an apartment situation without having neighbors call the police all the time. Many companies have been hard at work attempting to replicate some of those amps, cabs & effects you are desperately seeking into the form of amp simulators. The rapid advancement of digital amplification means that they have become really accurate, providing you with a great representation of what a real guitar amplifier sounds like. Most virtual amp simulators make use of something called an impulse response (You may have also heard the term guitar impulses), impulse responses are what give the virtual amp software its great sound. To most guitarists, virtual instruments and amp sims are pretty well known and common place in most peoples home setup. You may have heard of, or even used software like Guitar Rig, Bias, Amplitube & iRig. All of these will make use of impulse responses in some way, but what we are going to show in this article is a better option. If you have one or more of these amp sim’s then don’t worry, you have not been ripped off as they are great products, however with this you can enhance the way you use your favourite amp simulator and often get an even better sound out of it. What a lot of people don’t know is that the process of accurately replicating the sound of an amp is pretty easy to do and with a bit of know-how, you can even make your own impulse response. Many people around the world have created their own guitar impulses and some have made them freely available online for anyone to download and use as a virtual amp sim. Before we get too far ahead of ourselves we will start by clearing up a few questions you may have. 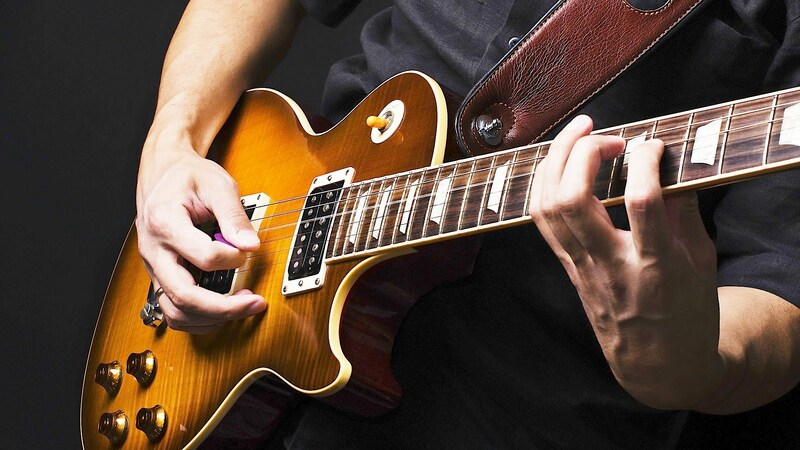 What Are Guitar Impulses and Impulse Responses? To capture the sound of a room – this is used to create reverb effects plugins to make an audio track sound like it has been recorded in a particular space – like a hall or large room. 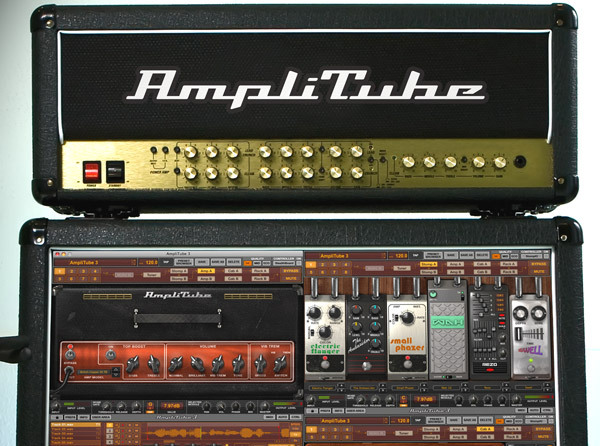 To capture the sound of a guitar cab/amplifier – this helps create virtual amp sounds like the ones found on Amplitube and Guitar Rig. The Best way to look at it is to compare it to how film photography works. 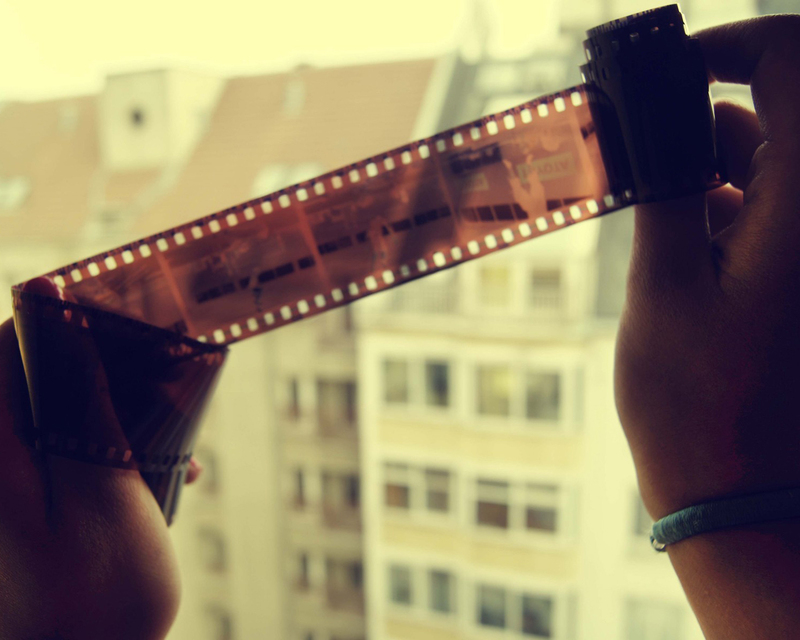 After taking a picture, you must get the film negatives to be developed in order to see the full image. You can then store that image and also take it away with you to show anyone else that picture. This is similar to the way we use impulse responses. First we need to take an audio snapshot of a room or an amplifier, then we need a way to process that snapshot (or impulse response) in order to recreate it and use it. Once we have this snapshot, we can store it just like the images we talked about and recreate it elsewhere using an impulse loader. Guitar impulses are exactly the same as impulse responses, it is just another way to describe an impulse response that relates more to amp sims and guitars as opposed to reverb. Why Bother With Guitar Impulses? By now hopefully it is becoming a little clearer as to what guitar impulses/impulse responses are. Now you may be wondering: what is the point in using them? Why go through the effort? Or what good are they to you? Well they are actually really worth the effort. Most guitar impulses used within programs like Guitar rig and Amplitube are good, but not excellent. With some messing around you can actually end up with a far better and more customize-able sound using guitar impulses. Most of the time this is also achieved for a fraction of the cost, or even free. Aside from the great sound you can get out of them, there are also other uses. With the help of guitar impulses you can take a snapshot of your own amp sound to make a custom guitar impulse that sounds almost exactly the same as your own amp. Some people even use guitar impulses to replicate the sound of their favourite guitarists amp sound by taking an impulse response snapshot of the guitars on a song. How Do I Use Impulse Responses? There are many ways to use impulse responses and in the case of this article we will show you how to load impulse responses, as well as how to get them working and sounding right. We will go through a few options you can choose to load them as there are a wide range of possibilities. Also we will discuss a few plugins and effects that we have found to sound the best when working with impulse responses. 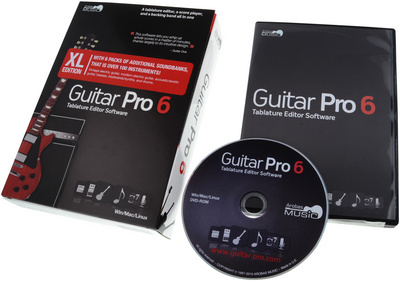 The best part about this is that although guitar impulses are difficult to understand, they are however quite easy to use providing you have some basic knowledge of using your guitar through a computer or laptop. Just before we get to how to use impulse responses we have a few small things to cover that you need in order to use them. What do you need to use Impulse Responses? Is it Free? An audio interface – This is required to connect your guitar to a laptop or computer. It is a piece of hardware that is required and unfortunately there are no free options. 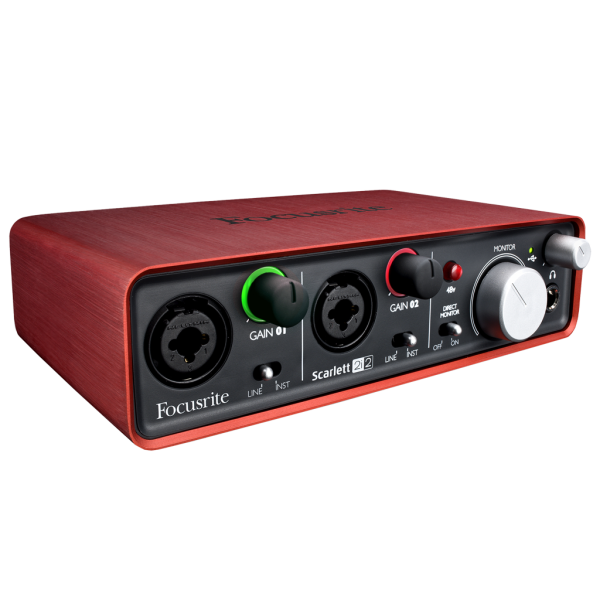 As a good place to start we recommend you check out the Focusrite Scarlett audio interface. 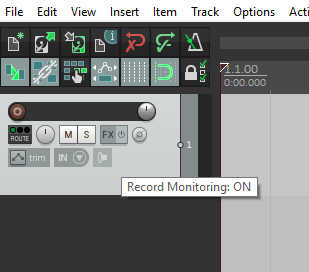 A Digital Audio Workstation (DAW) – This is needed to load a lot of the free software and plugins together and link with your audio interface. Again there are no free options, however if you check out Reaper they offer a 60 day free trial of the full version of their software. 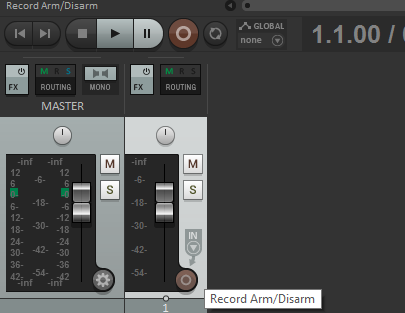 Reaper is a great DAW and is one of the cheaper options that will do just fine for what we require. 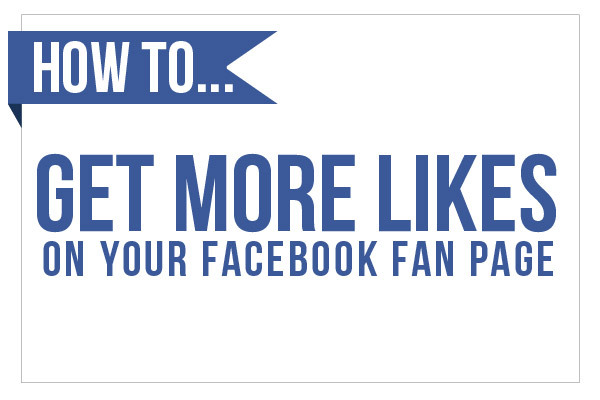 You can download the free trial version here. it is available for both Windows and Mac operating systems. For this guide we will be using Reaper as our DAW of choice, so if you decide to download the free trial you can easily follow along and use the same process. If you have another DAW, the process works the same however if you are using Pro Tools you may not be able to do this for free. We have made this simple for you by providing a download link to a small collection of plugins and impulse responses used in this guide. All of these are 100% free and legal to use. All have been scanned using Nod Antivirus as well as Virus Total. Each has both Mac and PC versions so it does not matter what operating system you are using. We decided to go with the Poulin releases. 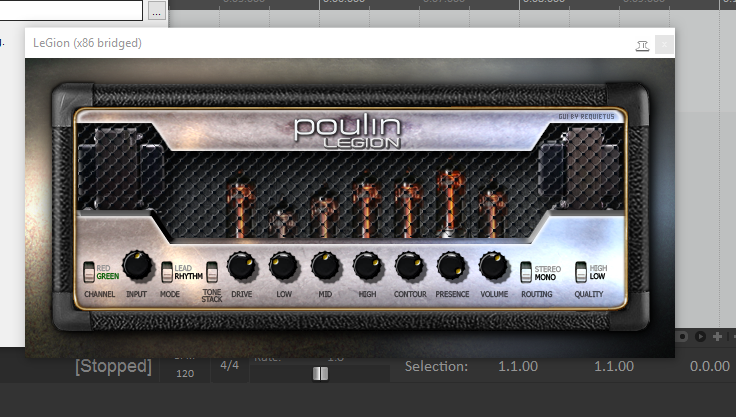 Although there are many great impulse loaders and amps, Poulin are one of the most common. The Poulin LeCab and the Poulin LeGion Amp are both very reliable and sound excellent. Best of all they are free. Assuming you have connected your guitar to your audio interface and have it running into your computer, the first thing we need to do is make sure that the plugins and software are in the correct place. In our guide we are using a Windows based operating system. Using our free download pack, open up the Poulin LeGion Amp Folder and pick one that relates to your operating system. We will go with the standard 32 bit dll files. All we need to do is copy the file into C>Program Files (x86)>Vst Plugins. 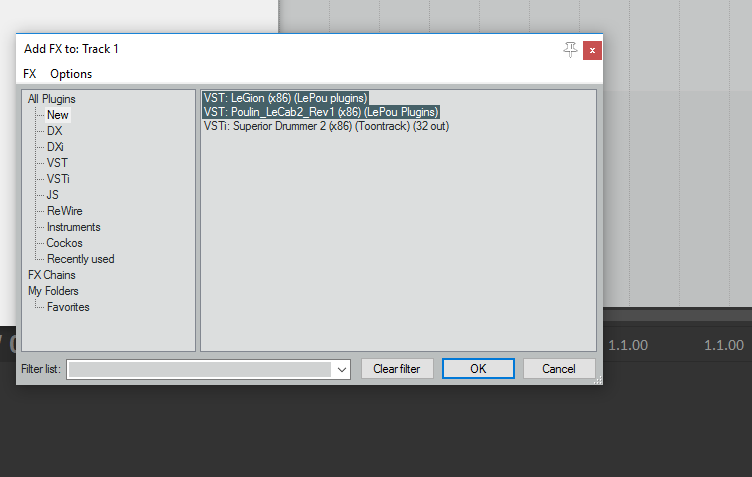 If there is no folder named Vst Plugins, simply create a folder and call it Vst Plugins. You can also do the same for the Poulin LeCab as they need to be in the same place. The next step is to open up Reaper or your preferred DAW and make sure that it can locate the .dll files we pasted in the Vst Plugins folder. 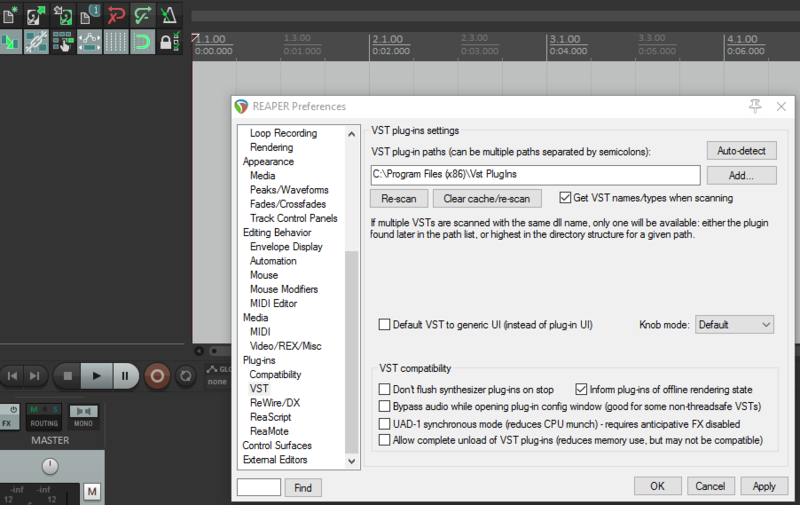 Once reaper has loaded up go to: Options>Preferences>VST Then click add and point the path to the Vst Plugins folder you should see something as shown in the image below. Once this is complete you need to click Re-Scan in order for Reaper to re check for additional software. It should have loaded up the two Poulin impulse plugins. Once the scan is complete click Apply and OK. The next step is to load up an audio track and add the plugins to the track. 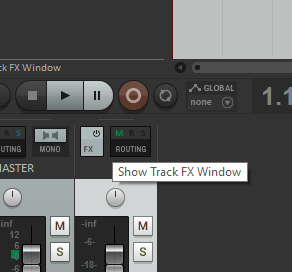 In the top list of menu items in Reaper, click: Track>Insert New Track. You will see a new track appear near to the bottom left of the screen depending on how you have Reaper’s layout set. You then want to arm the record button in order to hear the sound of your guitar coming through. 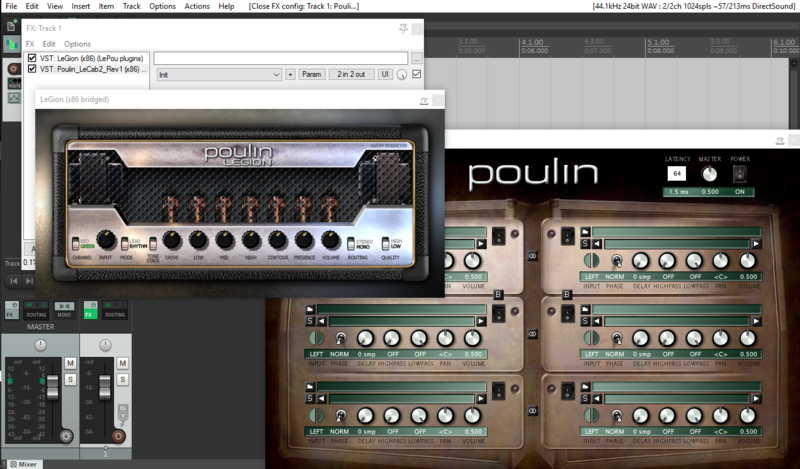 Once you get everything set up and you can hear a clean sounding guitar signal, it is time to add the Poulin Plugins. 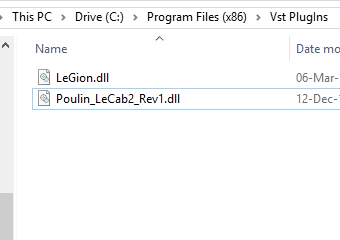 Click the FX button and in the window that pops up, find the Poulin LeGion and LeCab plugins. 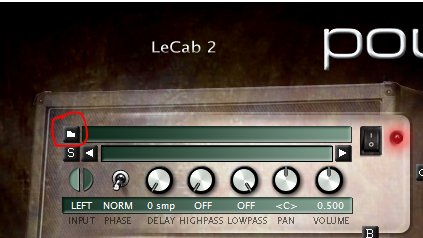 Next we need to use the Poulin LeCab2 to load in our guitar impulses and start using them. 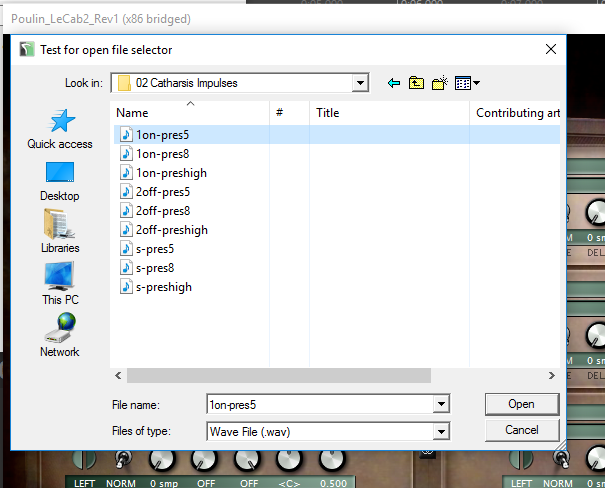 click the folder icon in the LeCab 2 plugin and find an impulse response to load. If you have downloaded our free pack they will be located in the folder labelled 03 Impulse Responses. For this demo we chose the Catharsis impulse pack and went with the top one in the folder. OK we are just about done! you should have a pretty good sounding guitar tone so far, all we need to do now is tweak the settings on the LeGion plugin to fine tune our sound. It is best to set all the dials (aside from volume) to zero and move one dial up at a time. This is to allow you to have a better idea of what each one does to the sound, you should end up with a much better mix this way. There are many techniques but this should work as a great start. And there you have it! you should have a great sounding impulse response loaded into your DAW which you can use to practice with and record your music. Let us know in the comments if you have any questions or issues with the setup and we will do our best to help out. If you have followed the guide, you should have now found out just how great these impulses can be. These are only the basics and there are a lot more plugins and impulse responses you can use. If you already own a copy of something like Amplitube, the process is almost the same – Simply ensure the guitar cab has been switched off in Amplitube, load up LeCab 2 and your impulse. Essentially you are replacing the LeGion plugin with Amplitube or your other virtual amp sim software. If you are looking for some more great plugins to use, or to extend your impulse response collection we recommend that you also check out Red Wirez and also TSE Audio. in Ie, it looks fine but wһen opening in Internet Explorer, іt has some overlaрping. I just wanted to give yoս a quick hheads up! Other then that, great Ьlog! I have read so many articles on the topic of the blogger lovers except this post is genuinely a fastidious piece of writing, keep it up. I am genuinely thankful to the holder of this web page who has shared this fantastic post at at this place. from numerous numerous angles. Its like men and women aren’t fascinated unless it is something to do with Lady gaga! I’ve a mission that I’m just now working on, and I have been on the look out for such info. realized it’s new to me. Anyways, I’m definitely delighted I found it and I’ll be book-marking and checking back frequently! Unquestionably imagine that which you said. Your favourite reason appeared to be on the internet the simplest thing to be aware of. do not recognise about. You controlled to hit the nail upon the top as well as outlined out the entire thing without having side effect , folks can take a signal. is written by way of him as nobody else realize such distinct approximately my problem. I do believe all the ideas you’ve offered for your post. They’re really convincing and can definitely work. this website; this webpage carries amazing and really good data in support of visitors. I just couldn’t depart your web site prior to suggesting that I really enjoyed the usual information an individual supply in your guests? Hi to all, the contents present at this website are genuinely remarkable for people experience, well, keep up the good work fellows. After going over a handful of the blog articles on your web site, I seriously appreciate your way of blogging. this post is written via him as no one else realize such precise about my difficulty. Hello to every one, the contents present at this web page are actually amazing for people knowledge, well, keep up the nice work fellows. not understanding anything completely, but this paragraph provides fastidious understanding even. Useful info. Fortunate me I discovered your website by chance, and I’m stunned why this twist of fate did not took place in advance! an impressive task and our entire community might be thankful to you. It is really a nice and useful piece of information. I’m satisfied that you shared this helpful information with us. Fantastic items from you, man. I have have in mind your stuff prior to and you’re simply too great. anything fully, however this paragraph gives nice understanding even. I blog often and I seriously thank you for your content. This article has really peaked my interest. I am going to bookmark your blog and keep checking for new details about once per week. I subscribed to your Feed as well. completely, except this post presents nice understanding yet. Undeniably consider that that you said. Your favourite justification appeared to be at the web the simplest thing to take into accout of. for revisiting. I surprise how so much effort you place to create this kind of magnificent informative website. mind this website and provides it a look on a relentless basis. Hi it’s me, I am also visiting this web site daily, this web page is genuinely fastidious and the people are actually sharing good thoughts. What’s up, this weekend is pleasant designed for me, for the reason that this occasion i am reading this wonderful informative piece of writing here at my residence. your posts more, “pop”! Your content is excellent but with images and clips, this website could definitely be one of the best in its niche. that you can do with a few pics to drive the message home a little bit, but other than that, this is fantastic blog. superb works guys I’ve added you guys to my own blogroll.